Former Irish Olympian, Maria McCambridge, who is a 40 year old mother is coming to the Charleville International Half-Marathon as preparation to make her bid to qualify for the 2016 Rio Olympic Marathon. She is using the Charleville race as her main race to prepare for the Frankfurt Marathon where she will attempt to set an Olympic qualifying time. McCambridge has been unlucky in the past not to be selected despite getting the qualifying time for the 2012 Olympics so hopefully this year she will be more fortunate. She will be aiming to again break the course record and win the Cavanaghs of Charleville Course Record bonus prize of 300 euro on top of the first prize. 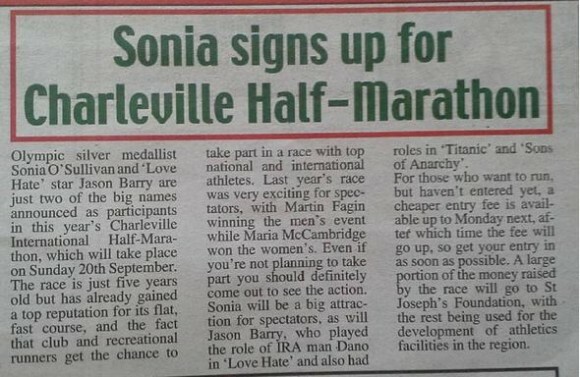 The Charleville International Half-Marathon (Sunday 20th September 10am) is in its 5th year and is continuing to grow and develop. It has gotten an extra boost this year with a generous sponsorship from Kerry Foods. The event is organised by North Cork AC as a fundraiser for both their activities and for St. Josephs Foundation. The club has donated over 8000 Euro to St Josephs Foundation over the past 4 years and are aiming to make a large donation again this year. As a sporting event with both a competitive field and non-competitive participants there has been great success in developing the Half-Marathon. The field of participants have grown over the past number of years; 2011 = 440, 2012 = 600, 2013 = 700, 2014 = 700 entrants and has grown again this year with already over 800 entrants. The significant growth in popularity of the event in both competitive and non-competitive participants is largely due to the flat course which allows beginners a good way of covering the distance without the extra difficulty of hills, and it allows the experienced runners set personal best over a high quality accurately measured course. Go to www.CharlevilleHalf.com/Registration to enter. Email: CharlevilleHalf@gmail.com with any queries. To ensure the safety of the runners there will be full road closures in place for 3 hours from 9:30am to 12:30pm with restricted access to local residents. The race will start on Bakers Rd, Charleville and from there progress along the R515 Charleville to Kilmallock Road. When reaching Kilmallock it will travel on to the main street towards the church before returning on the Glenfield Rd to the R515 again. The race will finish in St Josephs Foundation on Bakers Rd. There will be diversions in place to allow residents get to their destination.